Sunday is the day of fun, enjoying yourself with friends and not thinking about all the calories you eat. Sunday is my day of baking! We found these Funfetti recipe online and decided to try them with a bit alteration. 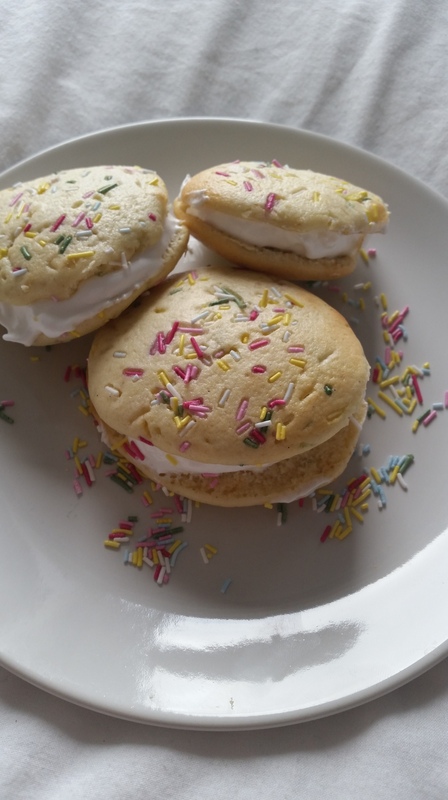 The recipe online says you should put buttercream in between the two cookies but we decided to put meringue cream. It tastes so much better and is a bit healthier than pure butter! And this is actually the first time that I succeed in doing proper meringue! These were really fun to make, we used so many sparkles on them, we could never get enough! I’m usually more of a baking a pie or cupcakes kind of person so doing these were a nice change. They look cute for the holidays and you can make them with kids who will think the sparkles add some fun! Mix the softened butter and sugar together. Form small round forms on a baking sheet and place in the oven for 12 min approx. Once they are baked through, let them cool on a tray before adding the meringue between two cake. While the top and bottom parts are baking, you can whip of the egg whites until they are stiff. I generally eat my sugar up in the microwave or oven for a few minutes as I think it incorporates better in the meringue. When the eggs are stiff, add a bit at a time the sugar while you keep whipping. The meringue cream is ready when it forms a creamy but stiff point. Do you have a new holiday recipe you want to share? This post is part of the monthly Our Growing Edge that challenges you into trying new recipes every month. This month’s theme is Holiday Baking and is hosted by Lauren from Sweet and Southern Lifestyle. Next Next post: Healthy Monday! : lunch time!